Channellock has put together a great general purpose tool roll set, and in my opinion it is the best tool set they offer. The Tool Roll No. 3 Gift Set includes the: 430 tongue & groove plier, 420 tongue & groove plier, 337 cutting plier, 3017 long nose plier, 526 slip joint plier. These 5 tools are a great addition to a DIYer's small collection of tools, and can be used for many of the most common DIY tasks. This is not some cheap tool set either, and should last a lifetime. Channellock sent me this set for review, and they also sent the one I gave away last month. These are the tools you would turn too for most of your plumbing/piping needs. You have two different sizes here that cover many of your household pipe sizes; they can be used individually to loosen or tighten leaky pipes, or they can be used in conjunction to hold one pipe while you twist the other. In many projects two of these pliers would be needed, so I think it was wise for Channellock to include two different sizes that have some size overlap. Both models are of the straight jaw variety and feature laser heat treated teeth. The 430 has a 2-inch jaw capacity, while the 420 has a 1-1/2-inch capacity. Cutting wire and other miscellaneous "stuff" is very common at my house and this is why the 337 is a must. Now, if you are doing a lot of electrical work with conduit and boxes, a lineman plier might be better suited, but I tend to use side cutting pliers more often. I like the way these side cutters can get into tighter places and offer better flush cutting capabilities. Again Channellock laser treated the cutting edge for better strength. I don't use long nose pliers very often, but I am glad this was included in the set. It is when you don't have one that you realize how valuable the tool is. The 3017 does not have a side cutter like you would find on other long nose pliers, or other Channellock models, but this task is covered by the above 337. This missing feature alone cuts down on the price, but still, some might miss the feature. The 3017 has a nice crosshatch grip patten on the jaw, but it only goes down 3/4-inch from the point. I would have preferred the gripping patten to cover the entire jaw surface. The 526 is probably the plier I turn to the most. Anytime I need some extra gripping strength on something relatively small, this is the tool I use. It is great for use on general nuts and bolts when precision is not needed. All in all, the 526 is the perfect tool for the odd job around the house. The quality on the 526 is superb; It is constructed with a rivet that provides only enough play to allow the plier to slip into position, and thus feels very solid. The 526 also has a built in wire cutting shear, but it only works for light gauge wire, and is best suited for solid wire. Keeping the set all neat and together is the Channellock blue tool roll. The roll seems solid enough and has a tie to keep it closed when needed, but I would have liked to see a couple of grommets in it so it could be mounted or hung from some pegboard. Like I said above, Channellock has put together a really nice set of high quality tools that are all made in the USA. 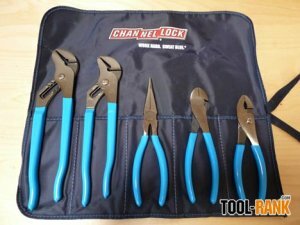 The only negative I can find, is that the pricing for the set on Channellock's website, offers no real bulk savings, and is almost the same as buying each tool separately. Amazon also has the set and does offer a bit of savings over the tools priced individually, but be aware that the tool roll they show is different (it also has grommets). Amazon currently has the set for just over $63, which equals more the $12 per tool, and in my opinion is a great value.